Nathalie Muller of Tyrells End uploaded this picture of sheep on the recreation ground as an experiment in editing the website, but it’s such a nice picture that Emrys Williams decided to turn it into an article. Click the picture for a much bigger version. It’s from a printed postcard, not a photograph. The recreation ground was levelled by the Bedford estate in about 1895, and granted tot he village as a recreation ground in about 1920. So were sheep grazed there in the meantime? It has a very posh fence for a sheep field! The orchard opposite the church is still in place in this picture, and bungalows were built there in the 1980s, so it’s definitely before then. The churchyard wall seems to have no railings on top, and they were removed in WWI. (not WWII). An eBay listing in August 2011 offered the same picture without the hand colouring. 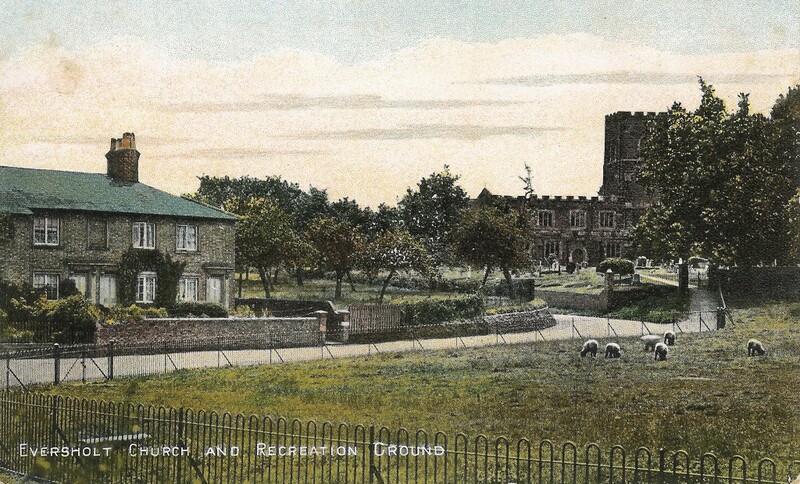 It described it as “A black and white printed postcard titled “Eversholt Church and Recreation Ground.” Published by Fisher & Son’s Woburn Series. Postally used 1906. Left edge crease otherwise Good condition.” Presumably, “postally used” means it has a date on it. Do you have any idea of the date of the picture? When were sheep last grazed on the outfield? When did the churchyard lose its railing? Leave a message below. Chris Hawkes rang to say that he remembers sheep being grazed on the recreation ground in the late 1940s and early 1950s. People played cricket there in the summers and sheep grazed there in the winters. Linden House, or the New Rectory, or maybe Eversholt House, or Mr. Sandys’s House!